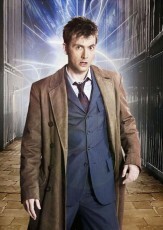 This Tenth Doctor Who Blue Suit is perfect for formal occasion that is inspired by David Tennant as seen in the TV Show. The complete package is made from cotton that includes a blue plain design coat and a fitting trouser. The pant has one pocket on each side and two back pockets. Order the 10th Doctor Who Suit that is the best formal choice for men! Note: To measure sizing, kindly fill the sheet and email us at sales@fjackets.com after placing your order - Download Sheet Here.